Calcium Silicate helps dough absorb water without lumps. Calcium silicate is an inorganic substance that can exist in different forms: CaSiO3 or Ca2SiO4. It is described as a very fine, white or off-white powder with low bulk density and high physical water absorption. 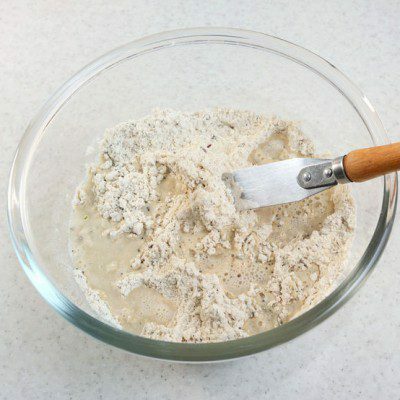 It is commonly used as anti-caking agent in food ingredients. The mechanism of calcium silicate is by water absorption. It is reported to absorb water at 2.5 times its weight to pull moisture away from the host ingredient.1 Calcium silicate has high water affinity. It traps water and retains it internally. It can also retain moisture during desorption, the release of one substance from another. Different anticaking agents function by different mechanisms. 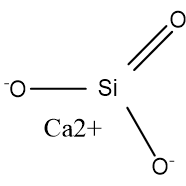 Other examples of anticaking agents are silicon dioxide and calcium stearate. Silicon dioxide functions by creating a barrier between host particles, which could decrease powder stickiness and possibly delay deliquescence, and by absorbing water. Calcium stearate functions by the ability to coat the host crystal particles, acting as a water repellant due to its hydrophobic nature, thereby preventing crystal-to-crystal contact and reducing total moisture sorption. When applying an anticaking agent, remember that other factors, like storage relative humidity (RH) and storage time, have a big influence on caking. Calcium silicate has other industrial uses besides anticaking agent. It is commonly used as a safe alternative to hazardous asbestos for high temperature insulation materials. It is also used as a sealant to cured concrete or the shells of fresh eggs. It reacts with calcium hydroxide or carbonate to form calcium silicate hydrate, sealing the pores with a relatively impermeable material. Lipasek, Rebecca A., Julieta C. Ortiz, Lynne S. Taylor, and Lisa J. Mauer. “Effects of Anticaking Agents and Storage Conditions on the Moisture Sorption, Caking, and Flowability of Deliquescent Ingredients.” Food Research International 45.1 (2012): 369-80. “CALCIUM SILICATE.” Process Flow Sheets. blogspot.com/2011/04/calcium-silicate.html Accessed 16 Jan. 2017. “21CFR182.2227.” Code of Federal Regulations. U.S. Food & Drug Administration, 1 Apr. 2016.accessdata.fda.gov/scripts/cdrh/cfdocs/cfcfr/CFRSearch.cfm?fr=182.2227&SearchTerm=calcium%2Bsilicate Accessed 11 Jan. 2017. “21CFR573.260.” Code of Federal Regulations. U.S. Food & Drug Administration, 1 Apr. 2016.accessdata.fda.gov/scripts/cdrh/cfdocs/cfcfr/CFRSearch.cfm?fr=573.260 Accessed 11 Jan. 2017.